01. JB Banfi - "Gang (For Rock Industry)"
02. Michael Garrison - "To The Other Side Of The Sky"
03. Iasos - "Lueena Coast"
04. Carl Matthews - "As Above, So Below"
05. Tim Blake - "Midnight"
06. Stratis - "By Water"
07. Laurie Spiegel - "Improvisation On A 'Concerto Generator'"
08. Mother Mallard's Portable Masterpiece Company - "Ceres Motion"
09. Michael Stearns - "In The Beginning"
10. Beverly Glenn-Copeland - "Ever New"
11. Richard Pinhas - "Sur Le Theme Des Bene Gesserit VII"
12. Tod Dockstader - "Piece#1"
13. Kevin Braheny - "Ancient Stars"
14. 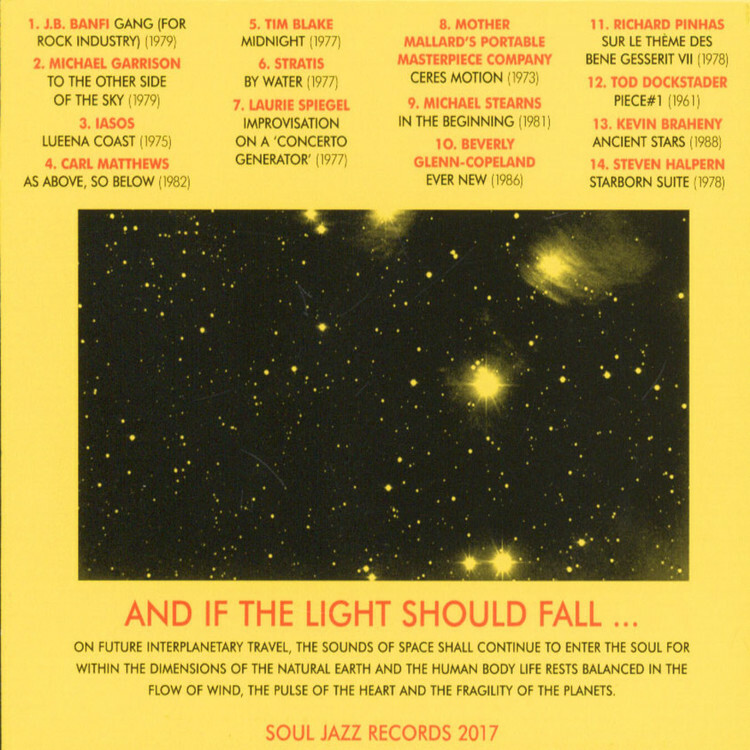 Steven Halpern - "Starborn Suite"
The latest compilation from the consistent Soul Jazz camp celebrates some of the far-sighted, space-obsessed pioneers of electronic music. It boasts not only cuts from synthesizer-doodlers of the '60s and '70s, but also "mid-'70s proto-new age gurus and 1980s, DIY-era guerilla artists. It's packed with thrilling curiosities and eccentric - but still fantastic sounding - tracks from artists that all but a handful of knowledgeable collectors have forgotten. 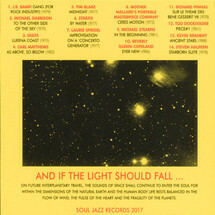 While some may be familiar with Beverley Glenn-Copeland, few will have heard the musique concrete experiments of Tod Dockstader, the deep space synth-scapes of Tim Blake, or the ensemble antics of Mother Mallard's Portable Masterpiece Group, the world's first all-synthesizer band, which was put together with the assistance of Robert Moog.